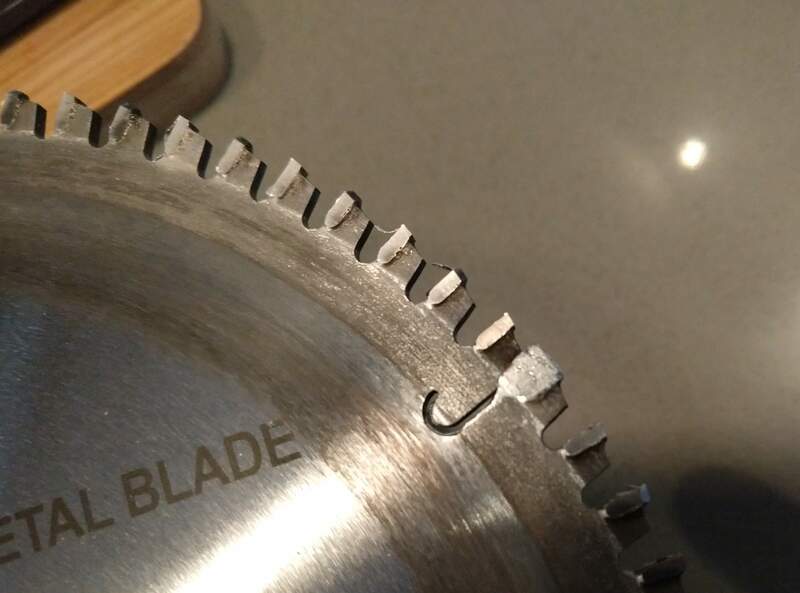 This may be the stupidest DIY question ever, but I want to make sure before I return it: is this non-ferrous metals saw blade faulty? In the picture, see where one of the titanium carbide teeth seems to be too large and to extend into the expansion slot. BTW, I had made 4 cuts of 9-15" or so, in 3/16 aluminum plate, before I noticed this; it cuts OK and seems like it could have been smoother, but I've never cut aluminum with a power saw before, so I don't really know what to expect. The filling is melted aluminum that galled/melted and filled the gullet and is covering one of the Tungsten Carbide teeth. You can pull it off with a pliers. The negative rake angle of the blade is fine for cutting aluminum, it will push your workpiece away instead of tending to grab onto it. It will generate more heat and be more likely to melt the aluminum. You can feed the work harder to generate a thicker chip to carry the heat instead of rubbing/melting it off. A little spray of WD40 on your path can help immensely. The J Shape is supposed to be there. Yes the J shape is supposed to be there for expansion. 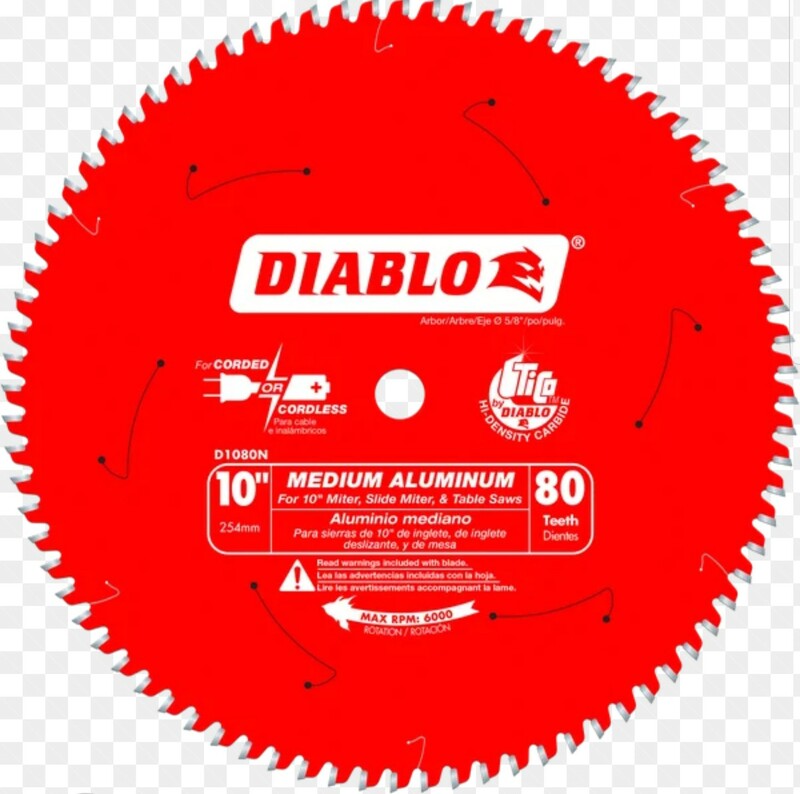 If you look at a Diablo blade it has the J relief cuts at the edges and also d-shaped relief cuts within the body of the blade. The large tooth looks like it may be build up of aluminum on the carbide tooth. It definitely doesn't look like carbide. If it is Aluminum it should be easy to pull off with a pair of needle-nose pliers. Aluminum is really good at gumming up blades. I'm pretty sure they actually make blades that are specific to aluminum to avoid the gumming up issue. I agree that the blade seems fine. Next time you are cutting, try using wax to lubricate the blade. You can use regular candle wax, but there is special wax formulated for this purpose and formed to make it easy to apply. I often stop mid cut and add more wax to the blade and kerf. I don't understand why are you not using a cutting wheel to do this is so much easier , whit this type of blade you are using creates so much vibration . I will use a metal cutting wheel, much smother less waste, faster work. Just a thought . Not the answer you're looking for? Browse other questions tagged tools powertools saw circular-saw or ask your own question. When should I replace a circular saw blade? How to change the blade on my mitre saw?